I must admit, I make a pretty mean Manicotti. I’d forgotten how good it is until I made some on the spur-of-the-moment this week. My Manicotti is probably not very authentic, seeing as I have no genuine Italian reference point at all. I don’t think it helps much that the recipe here got it’s start from the back of a box of Manicotti noodles either! Maybe I should just call this dish Cheesey Spinach Pasta Rolls and ditch the whole faux Italian thing! The instructions below will guide you in putting together a whole pan of Manicotti, but the recipe part is just for the creamy cheesey gooey yummy manicotti filling. You’ll need about 3 cups of your favorite spaghetti sauce to finish the dish (I make a hearty meat, mushroom, onion, red wine spaghetti sauce to serve with this dish, the recipe is posted on this site) along with one box of manicotti noodles (those really big. long pasta tubes). I’ve used the filling below to stuff large shell pasta, too, so you can use those if you can’t find the manicotti noodles. BTW, leftovers microwave wonderfully well. My my son has already zapped a few several times today. I hope he has left me some, leftover Manicotti is such a treat. 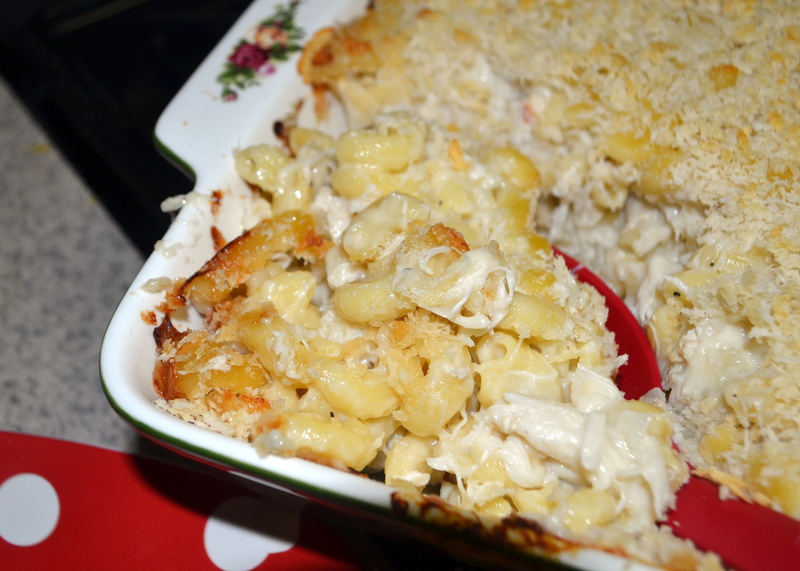 additional grated cheese, Parmesan and/or mozzarella, for sprinkling on top of baked casserole. Squeeze the spinach really, really dry and place in a large bowl. Stir in the cheeses: ricotta (I didn’t used to like ricotta, so I have substituted cottage cheese for the ricotta before), marscapone, grated Parmesan, and cubed string cheese or part-skim mozzarella. Stir well. Lightly beat the eggs and add to the spinach-cheese mixture. Fill cooked manicotti with the filling. The best way to do this is to put all the filling in a large Ziploc bag. Push the filling to one corner of the bag, then cut the corner off the bag–to make a sort of pastry bag-and squirt the filling into the manicotti. If this method doesn’t work for you, just use several long handled spoons (ice tea spoons work well) to fill the tubes. Some of the manicotti will have split. Try not to use the split ones, but if you have to just roll them tight and lay them seam side down in the pan. I think there are two more noodles than will comfortably fit into a 9×13 pan in each manicotti package, so you are OK discarding two tubes. Place 1 cup of the warm spaghetti sauce in the bottom of the 9×13 pan. Arrange the stuffed manicotti on top of the spaghetti sauce. Cover the arranged manicotti in the pan with the remaining 2 cups sauce–you might need a little more or a little less sauce. If you have leftover sauce, you can always serve it, warmed, on the side. Some people appreciate more sauce. Cover the baking dish with foil and place in a preheated 350 degree oven. Bake for 30-35 minutes. Remove foil, sprinkle any remaining cheese over top of the casserole, increase heat to 425 degrees and bake for an additional 10 minutes or until sauce is bubbling and cheese has melted and nicely browned. Remove casserole from oven and let sit for approx. 10 minutes before serving. Enjoy! Invite the family over for dinner. Maybe serve an antipasto platter to kick off the evening? I love antipasto, it’s a very social appetizer. Dessert? What is easier than a scoop of spumoni or gelato? Go ahead and gild the lily and serve some biscotti and coffee on the side, too! Can I come over? Have fun, and thanks for stopping by my kitchen today. I have not been very impressed with the food section of our local paper in the last, oh, decade. There is one column in particular that drives me iNSaNe. Typical recipes include a bit of Dream Whip here, Bisquick, Cream of Chicken soup and canned mushrooms there, with Tater Tots, Rice-a-Roni, and crushed up Ritz Crackers stirred into a can of Pineapple Tidbits on the side. PLUS, not one of the recipes has been tested by the columnist! (Although she does say how good they all sound and she might get around to trying one over the weekend…) Arggghhhhhh!! That all been said and vented, there have been a few recipes over the years that I have tried. And I have to admit, most have been pretty good. This one here is a keeper. The basic salad can be thrown together with cans from the pantry, and it’s good for you with lots of fiber from the beans and lots of other feel good stuff from the veggies. If you have some fresh herbs on hand, the basic salad can be jazzed up a bit, but it’s not necessary, the basic salad is good as it is. If you want to go all out, throw in a few chopped avocados and a pound of bay shrimp. This salad serves a bunch of people, so it’s ideal to take to any potluck or family gathering. I’ve made this a number of times, and I have only had the recipe for a few weeks. It’s been a popular side dish, and I love, love, love how fast and easy it is to throw together from ingredients I have in my pantry. This recipe was inspired by two recipes that ran in the “Home Plates” column in the San Jose Mercury News in June 2011, both recipes were attributed to Hazel Lawson Gentry. I took the best of both recipes, experimented a bit with quantities, and came up with this, my new “go-to” Pasta Salad. You can do the same! This recipe is very flexible and very forgiving. Make it yours! Cook the pasta according to package directions. Cool with cold water, and drain well. Combine the pasta with the can of undrained diced tomatoes and the drained beans, corn and olives. If using, stir in your choice of herbs, green onion, avocado and bay shrimp, and salt and pepper, if needed. Cover the salad with plastic wrap and chill until serving time. That’s all there is to it! Easy peasy! Thanks for stopping by my kitchen today. Print out this recipe. It will become a staple. Do you know how much stress is relieved by having a good, “go-to” pasta salad that can be made at the drop-of-the-hat, without a trip to the grocery store? Invite the neighbors over, get the burgers on the grill…, it’s Summertime and the livin’ is easy!! Depending on where you live, you may or may not have a proliferation of “Pho” restaurants in your community. If you do have a Pho restaurant nearby, I encourage you to try it out. You’ll be rewarded with a huge bowl of broth and noodles, to which you add fresh basil, cilantro, mint, bean sprouts, peppers, chili sauce, and freshly squeezed lime. The broth is quite tasty, and with the addition of all the toppings, the Pho has a very fresh taste. On your first visit to a Pho restaurant, stick to Beef Pho or Chicken Pho, with the parts of beef and chicken that you are familiar with. There are some other types of Pho which might be a bit challenging to an uninitiated American palate. Having fond memories of Pho, I wanted to make it for myself. I wanted to have a clear, rich, fat-free broth. I thought it would be great to have some of the broth on hand, and be able to boil it up and stir in some fresh ingredients whenever I wanted to. I also think Pho would be a great dish to make ahead and then take to share with friends and family at a snow condo or beach house. I found this recipe adapted from the cookbook Into the Vietnamese Kitchen at Steamy Kitchen. It’s great! I served it to seven friends, and three family members, and they all though it was great, too. SCORE! Before you make this dish, you should know how to pronounce it, “pho” is pronounced “fuh” and not “foo” or “foe” or “poe” or “puh” — that’s fuh-sho’! If you have made your own chicken soup before, Pho is no more bother. Follow the recipe below and make sure you buy good bones, start the day before, rinse and blanch the bones, have three hours to let the bones simmer. Then you can let the broth sit in the refrigerator overnight so that the hardened fat can be removed before finishing the pho. ½ lb flank, london broil, sirloin or eye of round, sliced as thinly as possible. Turn broiler on high and move rack to the highest spot. Place ginger and onions on baking sheet. Brush just a bit of cooking oil on the cut side of each. Broil on high until ginger and onions begin to char. Turn over and continue to char. This should take a total of 10-15 minutes. Don’t skip this part! Fill your biggest pot (12-qt capacity would be ideal) with cool water. Boil water first, and then add the bones, keeping the heat on high. Boil vigorously for 10 minutes. Drain, rinse the bones and rinse out the pot. Refill pot with bones and 6 qts of cool water. Bring to boil over high heat and lower to simmer. Using a ladle or a fine mesh strainer, remove any scum that rises to the top. Add ginger, onion, spices, sugar, fish sauce, salt and simmer uncovered for 1 1/2 hours. Remove the beef meat and set aside. Continue simmering broth for another 1 1/2 hours. Strain broth and return the to the pot. Taste broth and adjust seasoning – this is a crucial step. If the broth’s flavor doesn’t quite shine yet, add 2 teaspoons more of fish sauce and 1 teaspoon of regular sugar–and another pinch of salt, if needed (I over-salted my broth, so be careful). Keep doing this until the broth tastes perfect refrigerate broth overnight and remove hardened fat the next morning. Slice your flank/london broil/sirloin as thin as possible – try freezing for 15-30 minutes prior to slicing to make it easier. Cut or shred the cooked meat from broth and set aside. Arrange all other ingredients on a platter for the table. Guests will garnish their own bowls. Follow the directions on your package of noodles – for some fresh rice noodles, just a quick 5 – 45 second blanch in hot water is all that’s needed. Bring your broth back to a boil. Line up your soup bowls next to the stove. Fill each bowl with rice noodles, bean sprouts, shredded cooked beef and raw meat slices. As soon as the broth comes back to a boil, ladle into each bowl. The hot broth will cook your raw beef slices. Serve immediately. Guests garnish their own bowls with the mint, basil, cilantro, peppers, lime, and sauces. I hope you enjoy this soup as much as I do. It’s a chin dribbling, big bowl of healthy, comfort food with a fresh & crunchy twist. One of my favorite foods I believe. I have my fingers crossed that I will taste the real thing in Vietnam next year. I hope this measures up. Thanks for stopping by my kitchen today! Chinese Pasta Salad? Is there such a thing? I doubt it. So what is this?! I don’t know what else to call it! Chinese Pasta Salad is the name it came to me with and I welcome all suggestions for a new name 🙂 This cold pasta side dish is good. Very good. I made it for a potluck last night, and three people asked me to post the recipe. Always glad to oblige! Cold noodles, in a sauce of sesame oil, maple syrup (Chinese? I think not! ), and soy sauce with chopped dry roasted peanuts (again, Chinese? I think not), green onion and cilantro. I wouldn’t have made this if I hadn’t tried it first. Believe me, with this dish, the whole is better than the sum of it’s parts! An old coworker of mine, Mary Lou Stuart, brought this to an HR potluck at LifeScan on Tuesday, September 20, 2005. I know the date because I still have the email with the recipe (and that horrible name). I changed the method a bit, just to make it easier, but other than that, I made no changes. Please forgive me for mixing up my cultures and photographing this Chinese Noodle Salad (which isn’t) on a Japanese cloth. Also, the cilantro looks a little old, in the picture, doesn’t it? It is. I forgot to take a picture the day I served this. This is a picture of what was left in the refrigerator container because it wouldn’t fit into the serving container. So that cilantro has been sitting in the dressing for three days. Yours will look much better. The world is out of alignment today. 3/4 cup coarsely chopped dry roasted peanuts. Blend the maple syrup, sesame oil, and soy sauce in the blender. Pour over cooked and drained noodles. Add in chopped cilantro and green onions. Refrigerate overnight. Just before serving stir in the chopped dry roasted peanuts. Mary Lou said she sometimes adds about 2 cups of chopped cooked chicken to the salad (she uses a cooked rotisserie chicken). I’ve done this once or twice (with a chicken breast poached in a bit of soy sauce and water/broth), but actually prefer this salad without the chicken. Plus, it’s always nice to have something on the table for the vegetarians and vegans in the group. Thanks for stopping by my kitchen today. If you know Mary Lou Stuart, please forward this message to her. I have lost track of her. If she is uneasy with her name being on this post, I will use a pseudonym.